Funk. Most people don’t take the genre seriously. Even America’s most envelope-pushing family favorite television show Glee only explored funk once it had an established audience. And I get that, funk music is kind of dated. Maybe I’m forming this opinion from the pictures I’ve seen, but all I can imagine when I think of the original version of that Glee song is my mom and her friends about thirty years younger in glittery white catsuits jamming and jiving somewhere made almost entirely of plastic. I used to think of funk as kind of a joke until I really started listening to how complex and involved the instrumental compositions are in every song. I know that a lot much of funk music is born out of jam sessions, which makes the complexity of it even cooler. I discovered a brand new love for funk music after I saw Stevie Wonder perform at this year’s Bonnaroo festival. I probably looked crazy, dancing like that with all the moms, but there’s something so cheesy and corny and tremendous all at once about good funk music. Head to 1:04 of this video to see how Glee explains what funk is far better than I ever will. Funk music has this weird power because it’s freeing, somehow restoring your sense of positivity through its characteristically heavy bass lines and strange sexual implications. I seek out funk music the most on Friday afternoons or before going out. The same sense of excitement of either of those temporal situations matches the pure fun of funk music. I don’t know much about the artists associated with funk music and don’t really claim to besides the aforementioned undying love of everything Stevie Wonder has ever created, but I can listen to it for hours on end. When one of my good friends here asked me see his friend’s funk band play at this compound in Williamsburg that is somehow a restaurant, bar, bowling alley, and thousand-person venue on a Wednesday night two weeks ago, I knew I had to go. 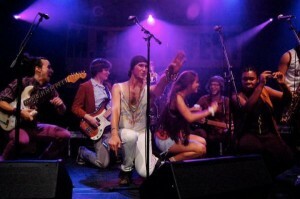 I was sold immediately when the ten piece funk masterpiece Mokaad took the stage. Before the show started, I was fascinated to see the breadth of people that Mokaad drew in – age, race, gender, creed and drink choice all didn’t matter. Once the band took the stage, I saw why that was: everyone there had come to get down. Needless to say, the band is AMAZING live (and unsigned!). It blew me away that that many people all on one stage could sound so tight. They have everything down pat: harmonious guitar, bass, and drums, full horn section, background singers that get it, and a really charismatic lead singer who really knows how to do those defining funk screams. Everything my friends sold me on was there in the show. I know I’m no major professional authority (maybe someday? ), but I’ve seen enough bands to determine those that have it and those that don’t. Mokaad has the passion, talent, and especially in their genre, the soul, to make it big. I know it’s only a matter of time before all or some of them do. At one point during the show, I looked around and noticed how truly diverse this situation was: I was dancing between a sixty-year-old man, two guys dancing in unison, one hipster grooving by himself, and two swarthy young professionals having a bona fide dance off next to three girls dancing with everyone. It was like all of New York City was in on this secret to support great music and have an hour-long dance party. The lead singer picked up on the good vibe of the crowd, as he challenged us to get as low as we possibly could, eventually to the point of lying on the floor, all in name of funk. I would’ve been totally grossed out if I wasn’t having so much fun. That moment demonstrates exactly why funk music deserves some more exposure and more respect – it’s impossible to stay angry about virtually anything when you hear the first boing-boings of a good funk baseline. It’s just so FUN. thanks a lot for the kind words! keep your eyes and ears open for the next show. You charlies friend from austraila? This entry was posted in Culture, Music, Opinion and tagged funk, glee, I still love youtube, mokaad, nyc. Bookmark the permalink.